Cafe Soya is a Vietnamese, Chinese fushion restaurant with a large dining area and a karaoke bar. It is a laid back place with tables of all sizes. I have spotted many Asians eating here, which I took as a good sign for the food. On this occasion I visited with my family after a long drive back home from a weekend away. We were quite tired and just wanted some proper food. One of the comments was that the menu is massive and easy to get lost in. This does however mean that there is a good sized vegetarian menu available. 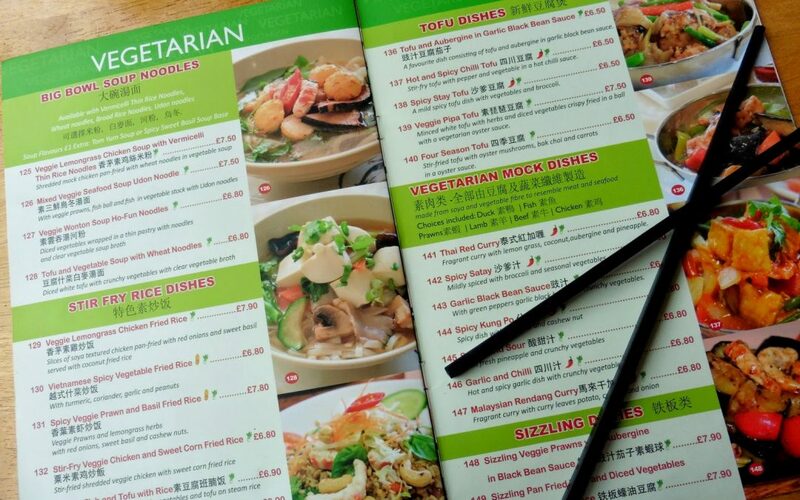 Vegan food is not specifically singposted, but on the website they say that if you mention beforehand you are vegan, they can cater to your needs. Dishes range from rice to different kinds of noodles to soup, but the real star here is the imitation meat. You might wonder why a vegetarian would want to eat something that looks and taste like the animals they don’t want to eat. But every now and again it is absolutely lovely to eat some chewy, salty, crunchy soy chicken and at Cafe Soya the soya duck/shrimp/beef/chicken is marvellous. The service can be rather atrocious at times, though. We waited quite a while for our orders to be taken. Being rather thristy we were confused to find our drinks were served after our meals, even if my brother ordered the rather exotic red bean and soy shake. The bill also took a long time to come. Conclusion: go to Cafe Soya for a bite out when the meat cravings start, but don’t expect admirable service. They have a great lunch deal on, though: 6.95 for a main + drink + desert. My family loves eating at Café Soya. It caters for all of us: vegans, veggies, and the meat and fish eaters. The food is reliably good. What you say about service is true, but we get into relaxed mood as soon as we go through the door so don’t mind waiting a bit. And I sometimes pop in to the smaller, original branch across the road (cash only payments) for the excellent value lunchtime special. The portions are large, so be hungry when you go! !